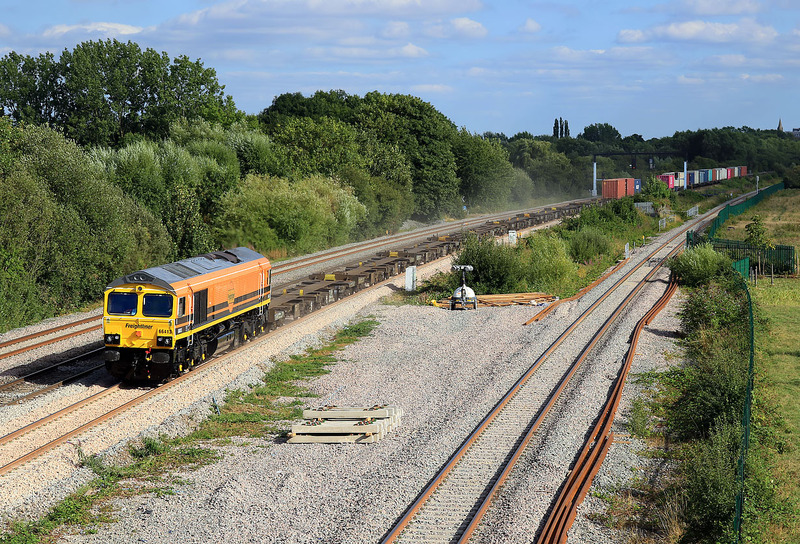 On its first day in traffic after being painted into Freightliner's new Genesee & Wyoming livery, 66413 passes Wolvercote on 2 August 2018 with the 4M67 14:17 Southampton Maritime to Hams Hall freightliner. Prior to its arrival I knew that there were no boxes directly behind the loco, but was still surprised that nearly half the train was empty! I was also surprised that no other photographer turned up at this location, especially as it is one of a limited number of spots in the Oxford area where the sun is on the front at this time. Note the dust being kicked up from the newly laid track.